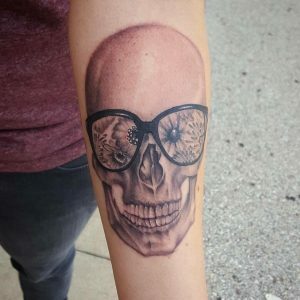 The Best Skull Tattoos from Rockstar Tattoo - Rockstar Tattoo & Co.
We’ve done a lot of skull tattoos here at Rockstar. They’re an often-requested theme, but that’s not to say any two skull tattoos are exactly the same. 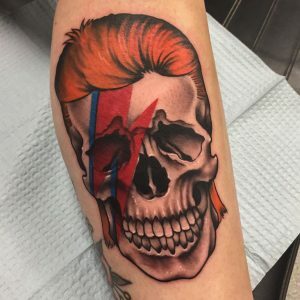 Every customer brings their own unique vision to the table and we’re fortunate to have so many talented tattoo artists to put their own artistic spin on every piece of art they create. 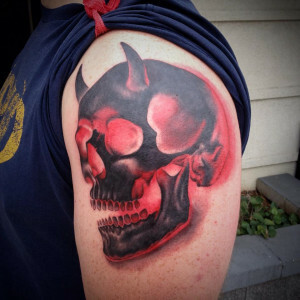 Here you’ll find just a few of our favorite skull tattoos of all time. 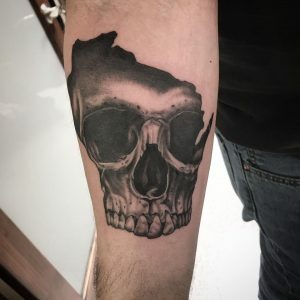 We’ll even go so far as to say they’re some of the best tattoos in Milwaukee. 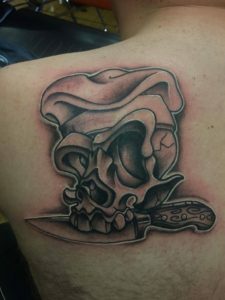 Patrick has done his fair share of skull tattoos. 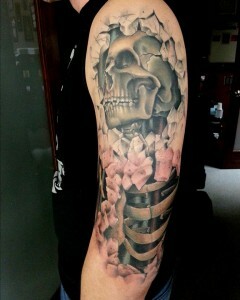 His beautiful use of color, shading, and creative add-ons, mean you’ll never see two of a kind. View more tattoos from Patrick. 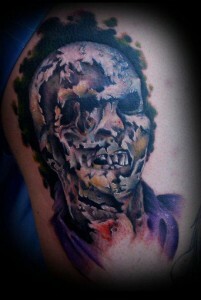 If you like your skulls a little frightening, then these tattoos from Dan might be more your taste. 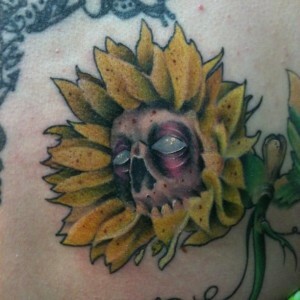 View more tattoos from Dan Gietzel. Pete has proven that it’s not only human skulls that make amazing pieces of art. 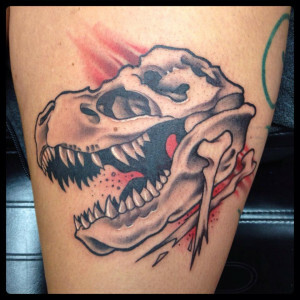 Feel free to request a devil skull or dinosaur skull the next time you book an appointment at Rockstar. 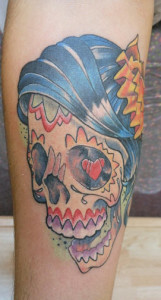 View more tattoos from Pete Silva III. 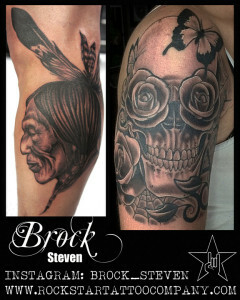 Brock is a true master at black and gray traditional realism tattoos and he’s done more than a few skull tattoos. We couldn’t include them all in this post, but be sure to check out his online portfolio. View more tattoos from Brock Steven. 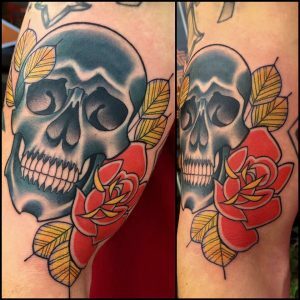 You’d have a hard time guessing that these two skull tattoos came from the same artist, but that’s just how talented Jay Purdy is. Whether you’re looking for a tattoo with some edge or something pretty and floral, Rockstar has you covered. 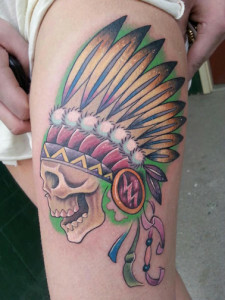 View more tattoos from Jay Purdy. 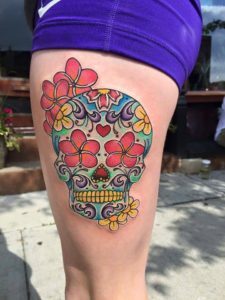 If you’re looking for a creative spin on a classic skull tattoo, then you may want to check out Ashley’s work. Whether you’re into drumming, flowers, or wearing spectacles, she’s got you covered. 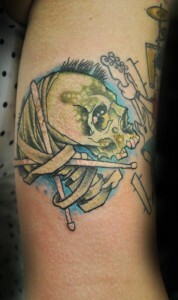 View more tattoos from Ashley Neumann. 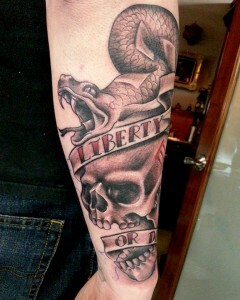 Erik has obviously done so much more than this single tattoo. But all good things, like this post, must come to an end and we think this neck tattoo is a pretty sweet note to end on. View more tattoos from Erik Nelson. 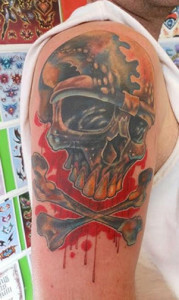 If you’re interested in getting a skull tattoo yourself, be sure to book an appointment at Rockstar Tattoo. We’re sure we have an artist who can bring your vision to life.